QPAT (Quebec Provincial Association of Teachers (QPAT) has let its members down especially the 70% of us who are women. We, the 8000 teachers in the English school boards in Quebec are the only teachers and public sector workers in Quebec without an important equity feature in our contract. The ANNEX XXXV on family-work reconciliation (or similar letter of understanding) is found in the contracts of the 100,000 francophone school board teachers (FSE and FAE) and in the contracts of all CEGEP Teachers, nurses, and health care workers – 330,000 Quebec public employees with whom we made up the Common Front. This important recognition asserts that. The bargaining parties encourage the local parties to facilitate the conciliation of parental and family responsibilities with work-related responsibilities, when determining and implementing working conditions. The members of QPAT, the majority of whom are women balancing work and family responsibilities deserve to have this very 21st Century recognition of their rights and their lives in their contract. It would encourage management to be more responsive and sensitive to accomodating family needs of teachers with our work conditions.Please sign if you support QPAT teachers (all teachers in the English Public School System in Quebec ) sharing in the rights of the francophon majority and if you support the advancement of women`s rights in the workplace. Dear Mr. Goldfinch,I am writing as a member of QPAT to express my concerns about our new contract. Many of the women and the young parents at my school share my concerns about the omission of the letter of understanding found in the 2010-2015 contracts of 100,000 teachers of the FSE and FAE that is absent from the QPAT contract. ANNEX XXXV in the 2010-15 collective agreement of FSE and FAE asserts the ”interdependence between work and family’, and makes the recommendation that management endeavours to ”organise work conditions” to allow for a better family-work balance”. For many of us with family responsibilities, in my case a highly dependent disabled child and my aging father, this understanding would allow for a more humane management culture and an enlightened context for discussions and arrangements around family-work balance. I have brought this omission to the attention of Peter Sutherland, and I am hopeful that the omission of 2010-2015 will be corrected. It would be helpful to know why we were denied this Annex to begin with. Forgive my feminism, but could it be because the QPAT executive is all male? Perhaps QPAT needs parity. If the the federal cabinet of Canada can do it, surely a small teachers’ union could. ANNEXE XXXV LETTRE D’ENTENTE RELATIVE AUX RESPONSABILITÉS FAMILIALES La CSQ (or FAE) d’une part, et le gouvernement du Québec représenté par le Conseil du trésor d’autre part, reconnaissent par la présente, la relation d’interdépendance entre la famille et le travail. En ce sens, les parties favorisent la prise en compte de la dimension de la conciliation famille-travail dans l’organisation du travail. À cet effet, les parties à la présente encouragent les parties sectorielles, régionales ou locales, selon le cas, à une meilleure conciliation des responsabilités parentales et familiales avec celles du travail, dans la détermination des conditions de travail et leur application. It is not clear to me nor to my colleagues why the 8000 QPAT teachers have been denied this important step towards creating better working conditions for our union members, the majority of whom are women. I hope you will look into this personally and make sure that QPAT teachers have this recognition that 100,000 of our francophone colleagues have. I will be doing my best to inform the membership of my union about this problem. Those present at the meeting for the Montreal Teachers Association’s strike vote heard a number of remarkable things from our union leadership. QPAT’s chief negotiator, Olivier Dolbec, for example described the various times teachers had been legislated back to work as victories in which teachers came out ahead. Dolbec’s central piece of evidence for this claim was that the back-to-work legislation of 2005 won us our current limits on class size. This might be an interesting point if it were true. In fact the current limits on class size were the central element in the 2010 negotiations that convinced teachers to vote in favour of a negotiated settlement. The 2005 strike resulted in teachers being legislated back to work with the exact provisions government had put on the table prior to the strike. In other words, this strike did absolutely nothing to move government from what it was intending to do all along. One would think that QPAT’s chief negotiator would have his facts straight on such matters. WHS teacher Robert Lavoie has taken up Mr Dolbec’s challenge. In this the first of a multi-part series Mr Lavoie presents a thorough comparison of the collective agreement of Quebec’s teachers with that of New Brunswick’s. As public outrage over the Quebec Liberal government’s attacks on public education has grown, so too has the movement to surround schools in human chains on the first day of each month. Oct. 1 saw this movement not only grow to over 300 schools throughout Quebec, but also include a significant number of schools in the province’s English school boards which were participating for the first time. The aim of this action was to send a clear message to Premier Philippe Couillard and his cadre: parents, teachers and support staff are united against the government’s attempt to balance its books on the backs of students. Of particular concern are proposals to remove limits on class size and cut a whole range of supports for students with special needs. Blais’ choice of words has left me with a serious question: Is Quebec’s Liberal government a government of sociopaths? Today parents, teachers, support staff, alumni and students formed a human chain outside of Westmount High School to send a message to the Couillard government that the public is united against its irresponsible cuts to education and its proposals to remove limits on class size as well as various forms of support for students with special needs. Much thanks to the teachers of Westmount Park Elementary for helping to make this event a success! Also thanks to The Montreal Gazette for producing this great video! Is striking an effective tactic for Quebec’s teachers? There is no question that the teachers of Quebec are angry. Already the lowest paid teachers in Canada, the government’s current salary offer would see Quebec teachers falling even further behind with their inflation-adjusted salaries decreasing by about 7% over 5 years. Of even greater concern is the fact that government is proposing to rid our contract of nearly every clause that protects our working conditions and the learning conditions of our students, from limits on class size to a range of supports for students with special needs. It is an understatement to suggest that the teachers of Quebec want actions that will pressure government to back away from its most regressive proposals. Most teachers are ready to make personal sacrifices in pursuit of that goal. The question for Quebec’s teachers is: what sort of action will actually be effective in achieving this goal? 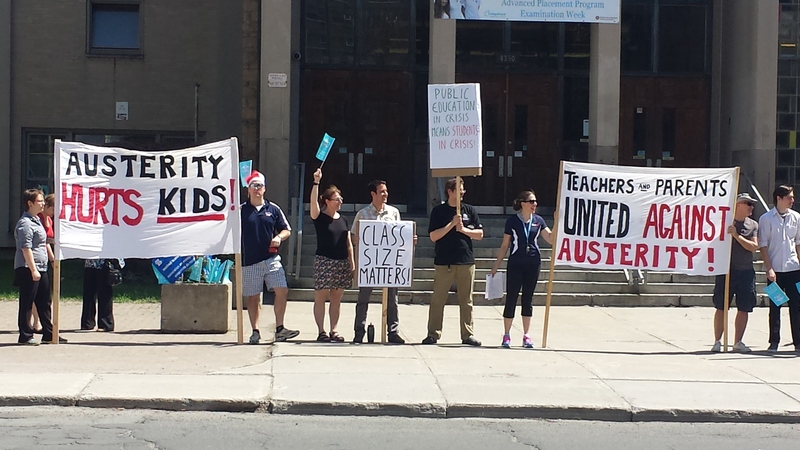 Last spring the members of the Montreal Teachers Association passed a motion in their annual general meeting stating that the action the members wanted to pursue was a work-to-rule campaign. The sentiment expressed by many MTA members was that the large number of unpaid hours worked by Quebec’s teachers was an enormous source of power. Given that teachers are not paid for enough hours to adequately do their job, withdrawing the volunteer labour done by teachers was seen by many as an effective way to create pressure within the system while avoiding the spectre of back-to-work legislation. Working to rule may not be as effective for other public sector unions but there was a strong sentiment that teachers were in a unique position to create real pressure with this tactic. There was also a feeling expressed that it would be far easier to build and maintain public support through a work-to-rule campaign than through a strike action which would create major inconveniences for families. With government proposing to remove current limits on class size and various supports for students with special needs, the teachers of Quebec need the support of parents. Below are links to two editable form letters parents can use to express their discontent to government. The first letter is for all parents. The second letter is written specially for parents of students with special needs. Simply download the .doc file by clicking on the link, open the file, add your name and the date, edit the “he/she”‘s and any other edits you’d like, sign the bottom and its ready to send. For the contact info of all Quebec MNA’s click here. WHS teachers Robert Green and Scott Macleod explain why teachers need the support of parents in their current conflict with the Couillard government on CKUT’s The Tuesday Morning After. Imagine your child sitting in a classroom with 35 to 40 other students. What kind of education do you think they will receive in such a context? How much help are they likely to get if they find themselves struggling with the material? How much time do you suppose the teacher will be having to spend on the unpleasant task of discipline versus the joyous tasks of fostering learning, creativity, compassion and a sense of wonder in students? Now imagine your child is one of many with special needs in this enormous class. What will be your child’s chances of succeeding if the limited supports currently in place for students with special needs are removed: no weighting system that ensures smaller classes when there is a higher proportion of students with special needs; no childcare workers in the class to assist the teacher; no resource room to turn to for extra help? Now imagine all of this is happening in a context where deep budget cuts mean reduced access to psychologists, behavioural specialists and counsellors. Parents throughout Quebec need to understand that this is what’s at stake in the current negotiations between the province and its teachers. It is no exaggeration to state that the Couillard government is proposing to rid our contract of nearly every clause that protects the learning conditions of students, from class-size limits to the various measures aimed at providing support for students with special needs. As professionals whose primary concern is the welfare of children, we cannot stand for this, which is why the teachers of Quebec have been left no choice but to engage in pressure tactics. Teachers Catharine Hogan and Robert Green discuss pressure tactics, class size limits and cuts to librarians and school maintenance with Tommy Shnurmacher. Does Quebec’s government have a mandate for austerity? Quebec’s growing popular movement against government austerity is about much more than opposition to a particular government policy. It is quickly becoming a battle over the legitimacy of Premier Philippe Couillard’s Liberal government. Whereas dictatorships and theocracies have relied on religion, tradition, ideology and the charisma of leaders as sources of legitimacy, secular democratic governments, which are supposed to be the heirs of Enlightenment values, have relied on elections and notions of the common good. In theory then, a legitimate democratic government is one that is elected on the basis of a transparent political program aimed at advancing the public interest. This raises the question of whether the government of Quebec, given its actions since coming into office, should be viewed as legitimate. A government with political legitimacy? Supporters of the Couillard government are quick to point out that his Liberal party won a significant majority in the last election and therefore has the right to govern as it sees fit. Teachers Catharine Hogan and Robert Green discuss pressure tactics and the untold hours teachers work without pay with Tommy Shnurmacher.